The International Trade Commission (ITC) on Wednesday issued its much anticipated report predicting the effects of the Trans-Pacific Partnership (TPP) on the U.S. economy, and its findings are damning for American workers. 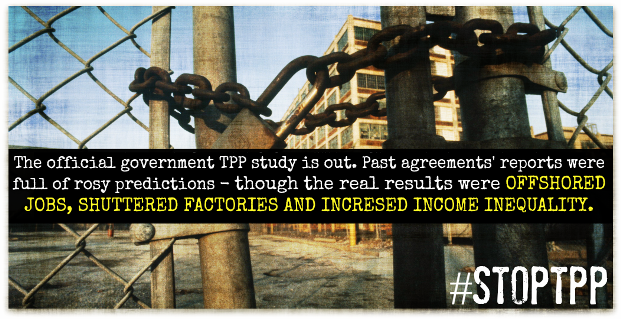 Read the IAM’s full reaction to ITC’s report on the TPP. The congressionally-mandated report digs deep into TPP, and the results aren’t pretty. It projects worsening trade balances in 16 of 25 U.S. economic sectors, including manufacturing, automotive, chemicals and others, finds Public Citizen’s Global Trade Watch. The overall U.S. trade deficit would balloon by an estimated $21.7 billion by 2032. “If ever implemented, the TPP could really be disastrous,” says Global Trade Watch Director Lori Wallach. The TPP would decrease U.S. manufacturing output by an alarming $11 billion per year, the report shows. The ITC, which predicted falsely rosy outcomes from NAFTA and other free trade deals, shows the TPP would actually decrease U.S. manufacturing employment. A Tufts University study, which used a model allowing for job loss and increasing income inequality, concluded the TPP would cost 448,000 U.S. jobs over the next decade. “This ITC report is so damaging that any reasonable observer would have to wonder why the administration or Congress would spend even one day trying to turn this disastrous proposal into a reality,” said AFL-CIO President Richard Trumka.